The Story: This wine comes from 5 specific vineyards tucked around Napa Valley, all with varying degrees of slope. Consequently, the fall rains that affected much of the crop in Napa in 2009 had a smaller impact on these vines and resulting wines. Hence, 5 Slopes! The Wine: Initial aroma is of classic, ripe, Cabernet Sauvignon's deep plum and spice tones with a trace of earthiness. On the pallet, soft, elegant fruit tones of plum and blueberry shine, with moderate acidity and a touch of oak to give the wine complexity and balance. The finish is unusually fruitful and lingering, with moderate tannins, and pomegranate tones. Fully powerful, this wine, features beguiling aromas, soft textures and a surprisingly complex, long finish. 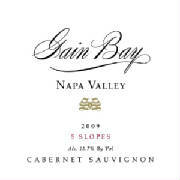 The Specifics: Hillside Cabernet Sauvignon (86%) shines in this wine, but it is as approachable as any Gain Bay ever. All of the Cabernet was from Coombsville except one barrel from St. Helena. Cabernet Franc from Diamond Mountain and Carneros comprise 11% of the blend, with the remaining 3% Petit Verdot from Diamond Mountain finishing the cuvee. The wines were all aged oaks from various French forests and coopers, but all in clean older barrels so the fruit and spice shine.